Do you come from a long line of bunion owners? Whether it's the throb of your big toe joint at the end of the day or the sharp, stabbing pain that accompanies every step you take, bunions can really get in the way of you living your active life. Maybe you've been told they run in your family and you're doomed. After all, they're genetic, right? Not so fast my friend. Just what is a bunion? Katy Bowman, biomechanist, defines a bunion in her book Every Woman's Guide to Foot Pain Relief* as "essentially an increase in tissue development or swelling along the medial border (the side closest to the midline of your body) of the big toe, in response to how the bones operate while walking. This swelling of the bone and soft tissue decreases the joint range of motion until the hallux is unable to point straight ahead or spread out away from the other toes." I especially love this part "in response to how the bones operate while walking." It's empowering. It means there's something you can do about it. After all, we can change how we walk, right? Of course! But what about the fact that bunions run in my family? Yes. Of course. Bunions often do run in the family, so it's easy to think that means they're genetic. But let's think about it. All sorts of things run in families - food preferences, sports we participate in, music we like, music we hate, politics, etc. etc. Even things like the shoes that are "good" or stylish. We even share movement patterns, including how we walk. Ever notice similar movement patterns between your mom and your grandma or your dad and your grandpa? Maybe they share the same glitchy knee, or hip, or........ bunion. We learn our walking and movement habits by observing people. If our mom walked turned out, we grew up having that modeled to us as a "normal" way to walk. If you, like me, grew up with ballet as a strong influence in your life, it was a status symbol to walk turned out. After all, that's how the greats like Baryshnikov or Margot Fonteyn, that we looked up to, walked. We can also end up walking turned out because of various tension patterns and/or muscle weaknesses. There is more and more being discovered these days about factors that affect genetic expression. If you really want to dive deep, this is a fascinating article on genetic expression. The cliff notes version is just because we have a gene, doesn't mean it's active. Genes become active and genes become inactive in response to their environment, which includes load - as in the way that a cell is loaded will impact how genes express themselves. Also, it's important to consider the research data - what pool of people did researchers draw their conclusions from? If we're only looking at a population of European shoe wearers to determine the genetic likelihood of bunions, we may get a different result than if we're looking at a non-shoe wearing population (and a population that doesn't sit habitually and one that moves frequently). In short, it's complex and to conclude that bunions are genetic may not be accurate. With that said, there are some rare collagen disorders that create whole body joint instability and would contribute to bunion formation. The key words being "rare" and "whole body". For the vast majority of us, this is not relevant. 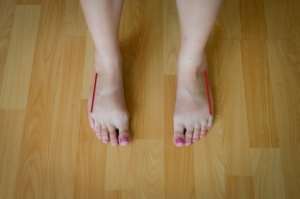 What if bunions have more to do with our foot wear choices and our movement patterns? Take a minute and stand up for me. March in place for a few seconds. Stop. Look down at your feet. See something that resembles this? Wear shoes with narrow toes. Here are 3 simple (but not always easy) things you can do to rewrite the bunion recipe. 3. Check your shoes, does the toe box match the shape of your foot or is it narrow and pointy? If it doesn't, look for shoes that do match the shape of your foot. Are you a pelvic floor statistic?